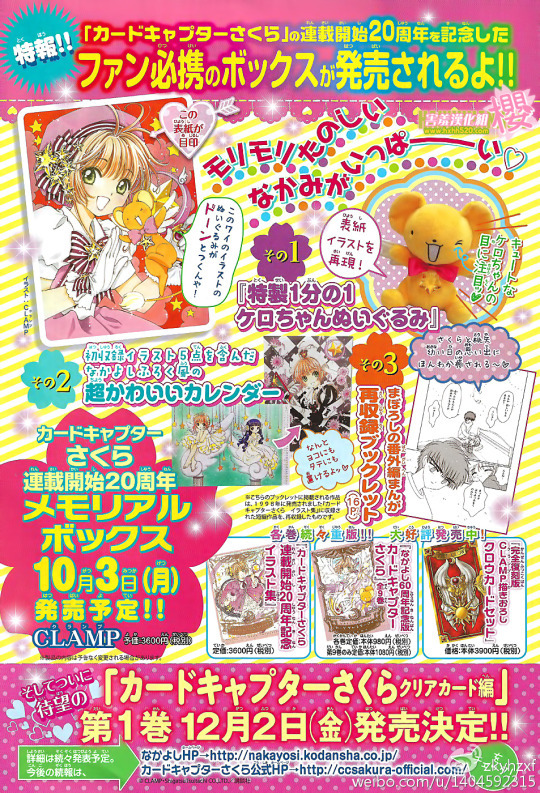 This month’s Nakayoshi magazine is announcing that the first volume of Card Captor Sakura – Clear Card arc will be released on December 2. More details regarding format and pricing to be announced soon. With that, we have the confirmation that we’re not getting a volume 13 — as we all anticipated. The magazine also has more information regarding the contents of the upcoming Card Captor Sakura 20th Anniversary Memorial Box, to be released in October. It is also confirmed that the 16-pages booklet will be of the short story originally published in the first Card Captor Sakura artbook. The very first edition was indeed at a very good price, and also very pretty: we got new color arts on both side of the inside cover, and then more new arts on the dust cover, and then a bookmark as a gift with yet more new art! But nowadays, with CLAMP mangas at least, unless it’s a normal edition: no color pages, yes dust cover but the only new art is the front cover (inside cover is blank and the other side of the dust cover is something random) + no extras inside, you can’t have that sort of price: the regular edition of TWC released this month cost 486jpy, and is like I described. The 12-volume set is currently in print with all the extras included. I bought it for myself late last year, and the books came with updated obi slips, advertisements for TWC and xxxHOLiC Rei, and even the character card bookmarks. And It’s still only 500 yen per volume! I’m going to be getting the Japanese editions as they come out, but this is one of those rare cases where international fans might be getting a better deal than their Japanese counterparts. For example, if you take a look at the Dark Horse omnibuses released for the US market, they have larger page sizes and more color illustrations than the 9-volume anniversary set. They’re only slightly more expensive, too. I really hope it will include at least the first color pages. Hard to get all of them like the 2005 deluxe edition. Or maybe it’ll get a Tsubasa treatment and have both regular a deluxe versions available. That would be neat and CCS deserves it. It’s a ‘card shaped’ calendar with 5 pages (I assume: 1 cover and 4 pages with 3 months per page), a description which does not match the picture we are seeing above, UNLESS, and this is my PERSONAL idea, that the calendar pages are…two faced. When I first heard it would be ‘card shaped’ the first thing that came to mind was obviously the clow cards: either their rectangular shape or maybe their design on the other face of the calendar’s pages? But ‘card shaped’ here might really just be telling us that it’s sort of a postcard thing: art on one side, blank on the other to write; but in this case instead of blank we got a calendar page? But now: what is the actual TRUTH of the matter? Can someone read the japanese text on the ad above? The month and dates are printed on the bottom of the newer illustration with Sakura in her chess costume — it’s partially covered up by the text box. The text states that you can display the calendar either horizontally or vertically. So yeah, it looks like it’s going to be a sturdy, two-sided calendar. 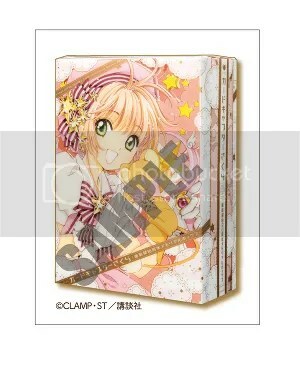 They just posted a new entry about it in the CCS official website, and we now have a preview of the box! I am probably not buying this… the price is very expensive for its contents. Am I the only one who thinks that? Honestly, it *is* disappointing even while knowing the title should have told us not to expect much, it’s a “memorial” box after all. All in all, not something I would recommend someone to purchase, but as said, something I happen to ‘need’ in my collection. And I assume this will be the last exception I make: from the vol1 of CCS CC and beyond, I guess I will only be buying new material from that point on. At this rate, even if the Memorial Box calendar contains never-before-seen artwork, I’m just going to hang tight and wait for the inevitable new illustration collection. That’s really weird… unless it’s gonna be a mix of both new and old arts. I think that’s it. The press copy states that the calendar will publish 5 illustrations for the first time. Whoever wrote the advertisement might be trying to re-frame some pictures never published in the art books as “new illustrations,” but CLAMP could really be preparing five new pieces of art for the calendar. I’m sure Cutesherry will kindly find out for us when October rolls around!